The parish church of St Mary and All Saints in Willingham is a mainly 13th-century building blessed with a wealth of wonderful medieval wall paintings. The paintings were discovered in the 1890s when Rev John Watkins had the church restored. He discovered the wall paintings hidden under layers of whitewash, possibly put there by staunch puritans during the Reformation. Perhaps the most memorable of the paintings is a depiction of St Etheldreda, the 7th-century founder of a monastery on the site later occupied by Ely Cathedral. Nearby is another female saint, possibly Etheldreda's sister, St Sexburga. These two paintings probably date to around 1260. There is also a very fine 14th-century painting of St Christopher on the north wall of the nave, as well as a scene of St George killing the dragon. There are 15th-century images of the Annunciation and Last Judgement, and a huge number of surviving 16th-century painting fragments throughout the church. There are even later Jacobean paintings of scriptural texts as well, making for a quite marvellous collection of paintings spanning at least 400 years. At the same time that the wall paintings were uncovered, a series of 12th-century carvings were found in the south wall of the chancel. These carved stones have been reset in the walls of the south porch. The church is composed of an aisled nave with a clerestory, chancel, north sacristy chapel, south porch, and a west tower with spire. The south chapel was used as a chantry by the de Brunne or Bourney family. A large tomb in the chapel is to an unnamed 17th-century member of the family. 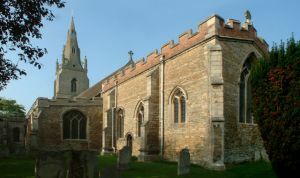 In the 17th and 18th century the chapel was used as a school, and the windows, tomb, and screen all bear carved initials of boys attending the school. Aside from the wall paintings, perhaps the most interesting features are the screens, which are one of the finest and most complete collections of medieval screens in East Anglia. The screen on the north side of the Ely Chapel is possibly the oldest in England, and has been dated to around 1320. It is beautifully carved and traceried in elegant style. The tracery contains numerous small carving of faces, some humorous, some simply grotesque. There is an early Perpendicular font, carved on only 7 of its 8 sides, suggesting that it was originally meant to stand beside a pillar, where the 8th face would remain unseen. The pulpit is also of Perpendicular date. One final part of the church worthy of note is the nave roof, a lovely double hammerbeam design, ornamented with carved wooden angels. Some of the angels carry heraldic shields, while others bear musical instruments. The rafters are carved with a variety of symbols, including a saltire, cross, crowns, mires, and arrows.